EurekaLog's event is similar to standard Delphi/C++ Builder events, such as OnClick for TButton. Event handler is callback procedure or method, which you regiter for some event. EurekaLog will call your event handler (i.e. your code) each time this event occurs. There are many events available. Most commonly used are OnExceptionNotify and OnExceptionAction. Important note: event handlers will not be called during leaks processing. That is because leaks detection happens AFTER finalizing application. See Configuring project for leaks detection for more info. Note: each event handler is declared as both method or procedure. You can use either option, there is no difference between method and procedure, so you can use whatever you want. • While there is no limitation on TEurekaLogEvents components in one application and no restrictions on the form (it can be main form and any child/auxilary form), we recommend to use main form as host for TEurekaLogEvents component whenever possible. • We recommend using component only for such events that depends on your host form. For example, event hanlder may add currently opened document to bug report. Such event handler is best registered with component. We don't recommend using component for more generic event handlers. Use code registration (see below). Note: registering event handler via component will create/use event handler as method of the object (i.e. form), not as callback procedure. 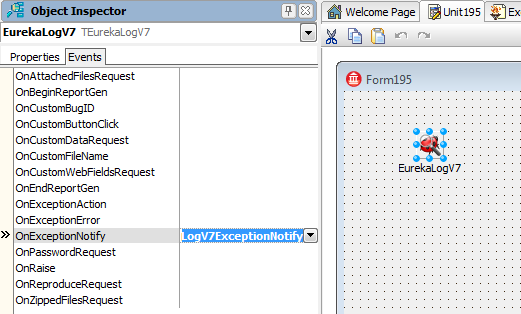 This sample event handler will log call stack of each exception of EMyException type, and it will disable EurekaLog's processing for these exceptions. As you can see - you need to write all code by yourself (i.e. handler registration and procedure header/prototype). All events are declared in EEvents unit. Note: you may unregister registered event handler by using UnregisterEventName function, but it's not required. The similar concern is applied for many other objects in EurekaLog. Such as dialogs, send engines, log report builders, call stack classes, etc. They all have Options property, which is captured from their "parent" or CurrentEurekaLogOptions if there is no "parent". • Event hanlders offer you unlimited ability for customizing EurekaLog, but only within certain points of interest (i.e. events). You can't alter whole processing logic by using only event handlers. Important note: ensure that features specified by your code will be available at run-time. For example, if your application uses MS Classic-styled exception dialog by default and you want to switch to EurekaLog-styled dialog with your code - then be sure to include code for EurekaLog dialog into your application. The same is true for send engines. Hooks and debug information providers are registered on startup and could not be customized at run-time.